If you have followed what has happened in Wisconsin during 2015, you know it has been a difficult year, to say the least. You also know that Common Cause in Wisconsin has been in the forefront of the opposition to Governor Scott Walker and the Republican legislative leaders – Assembly Speaker Robin Vos (R-Rochester) and Senate Majority Leader Scott Fitzgerald (R-Juneau) – and their obedient, hyper-partisan minions as they have shamelessly destroyed numerous state "good government" institutions and checks on political corruption, transparency, and accountability to the voters and taxpayers of Wisconsin. This unprecedented devastation is encapsulated in this opinion-editorial we wrote and which was published recently in the Wisconsin Gazette. But while bowed, we are certainly not broken; in fact, we are more inspired and determined than ever to reclaim our state from this hijacking. CC/WI does an online "ask" for your financial support only at this time of year in order not to irritate you with constant, year-round pleas of support. If you value our work and are able to help support us so that we can continue to be pro-active and effective, please consider making a year-end contribution to CC/WI. We would be very grateful to have your support! Here is how you can do so. from all of us at Common Cause in Wisconsin! To the surprise of absolutely no one, Governor Scott Walker today signed into law two measures that had the support of virtually no Wisconsin citizens and which were designed for one purpose only: to consolidate and maintain one party political control of Wisconsin as we head into a critical Presidential election year. Both measures were crafted and rammed through the Legislature to please Eric O'Keefe of Wisconsin Club for Growth, Charles and David Koch, Wisconsin Manufacturers & Commerce, Wisconsin Right to Life, the Wall Street Journal editorial board, National Review magazine and a handful of other powerful politicians and right-wing partisans who are far more interested in consolidating their political power than in the well being of the vast majority of Wisconsin citizens. Henry F. Potter, the richest and meanest man in Bedford Falls, would have approved. The corrupt status quo in Wisconsin has not only prevailed this past Fall, it has triumphed completely. For now. The majority party in the State Assembly and State Senate moved Wisconsin far back into the past, vanquishing more than 100 years of transparency and sensible limits on special interest political money – reforms which, in part – date back to the Governorship of Robert M. La Follette, Sr. This assault on democracy, while supported and encouraged by Walker, was largely the handiwork of Assembly Speaker Robin Vos, State Senate Majority Leader Scott Fitzgerald and a cadre of hyper-partisan Republican legislators whose lust for total and absolute political control trumps any lingering respect they may have had for bipartisanship and for open, transparent, accountable and honest state government. The destruction of the eight-year-old, non-partisan Government Accountability Board was based on completely discredited charges, false premises, character assassination and outright falsehoods. The enactment into law of both the GAB destruction (Assembly Bill 388) and campaign finance deform (Assembly Bill 387) measures – together with the recently enacted law to exempt political crimes from being investigated under the state’s John Doe process – will all combine to allow political corruption to take root and flourish in Wisconsin. This will be remembered as one of the saddest and darkest chapters, at the end of one of the most horrendous legislative floor periods, in our state’s 167-year history – when honest, accountable and transparent state government was systematically dismantled in favor of hyper-partisan political advantage, retroactive decriminalization, and revenge. The entire process under which Assembly Bills 387 and 388 were first unveiled in October, fast-tracked through a single public hearing in Madison only, and then rammed through committees and rushed to the floor of the Wisconsin Assembly and slammed through, before being stalled for a week in the State Senate, has been among the most abusive, disrespectful, secretive and utterly anti-democratic in the history of the Wisconsin Legislature. * Codify into law the ability of candidates to be able to collude and coordinate with outside special interest groups in campaigns as long as the outside groups avoid using a few selective and limited words in their communications, such as "vote for" or "defeat" or "support." This is what is known as "express advocacy." Outside communications that use virtually any other words, however negative or laudatory, can be coordinated with candidates and, furthermore, require no reporting or disclosure of the donors. This is relatively unprecedented in the nation. Only Florida allows this. But the Wisconsin measure goes even further than Florida by allowing coordination between candidates and outside groups who engage in express advocacy as long as there is no explicit discussion of that coordination! What it all means is that a tsunami of secret money from within and outside of Wisconsin can flood our elections to influence our votes. No other state allows for as many opportunities for political money to escape simple, basic disclosure as this legislation will allow in Wisconsin. The purpose is simple: to keep Wisconsinites as ignorant as possible about who is influencing elections and controlling public policy-making in this state. * Allow political parties and legislative campaign committees (slush funds controlled by state legislative leaders) to collect significant corporate and other special interest money and individual contributions of any amount, with no limit for distribution to candidates and allows them to run undisclosed phony issue ads and to coordinate with phony issue ad groups. This will greatly enhance the power of the major political parties in the state but, much more alarmingly, will vastly increase the power of legislative leaders with unlimited political money to bestow upon, or withhold from candidates, at their whim, and to crush any dissent and threaten with primary opposition those legislators who defy the leaders and try to exercise independent judgment. This was at the heart of the 2001-2002 Legislative Caucus Scandal – political money in the Capitol compromising and undermining pubic policy-making. This provision will lead to far more secret money and opportunities to engage in illegal activity without detection. * Eliminate the currently required information about employers from individuals who make political contributions to candidates for state office. All that will be required to be reported will be the name, address and occupation of the donor. Which tells the public very little about her or him. Republican legislative proponents of AB 387 have continually made the completely false and erroneous claim that they "had to" craft this legislation in order to bring Wisconsin into "compliance" with the Citizens United vs. F.E.C. U.S. Supreme Court decision of 2010 and because of other court decisions since that time. While some revisions to Wisconsin's decades-old campaign finance law are necessary, the revisions in this legislation most certainly are not required. Coordination can still be limited and disclosure can certainly be required. This measure was specifically designed to shroud Wisconsin in an impenetrable veil of secrecy and dark money, destroy transparency, and inject Wisconsin with an unlimited and inexhaustible supply of special interest money to ensure Republican control of state government for the near and distant future. That's not democracy, it's oligarchy. Then, the majority party undertook the dismantling and destruction of the 8-year-old, nonpartisan Wisconsin Government Accountability Board. Twelve Republican State Senators who voted to establish the GAB in 2007, voted to destroy it. Nothing changed in the intervening 8 years except the politics. So these 12 State Senators were all for the GAB before they turned against it. * Gets rid of the six non-partisan judges and replaces them with two six member commissions, one for elections and one for ethics, comprised of partisan political appointments – three Republicans and three Democrats – which all but guarantees tied votes and, therefore, gridlock and inaction. * Gets rid of Kevin Kennedy. He has overseen elections and campaign finance law in Wisconsin for more than 30 years, capably and in a scrupulously non-partisan manner. He will be replaced by two administrators who will be selected by partisan legislative leaders. * Most significantly, it eliminates the independent, "sum sufficient" funding for investigations by the GAB into possible political corruption (being perpetrated by legislators, for example). This was the absolute most critical and central component of the creation of the GAB in 2007. Without it, the GAB is under the complete control of the legislative leadership. This independent stream of funding for investigations acted as a huge preventative tool for corruption in the Capitol. Without it, the GAB will be feared by no one and ignored by most. That is by design. The GAB will be transformed into another Wisconsin Economic Development Corporation – a toothless, ineffective state agency with no ability to effectively enforce election, campaign finance, ethics and lobbying law. And it will likely be utilized as a tool to aid in the achievement of the partisan political goals of the leaders of the Legislature and the Governor. These profoundly anti-democratic measures are not the sum total of the majority party’s assault on good government in Wisconsin. Renewed attempts to weaken and even eviscerate our state’s open records laws, as well as to undermine the effectiveness of the respected non-partisan Legislative Audit Bureau by adding partisan political appointments in all state agencies, are in the works for early 2016. And there may be more. Thomas Jefferson said that the price of liberty is eternal vigilance. And so it is that Wisconsinites must, not only be more vigilant to stave off further erosion of our democratic institutions, but we must also organize, register to vote, turn out and work as never before to take back Wisconsin from those who seek to destroy it. We will never forget these past several months when democracy and transparency in Wisconsin were brutally assaulted and curtailed. But we will never give in or surrender and will continually strive to restore democracy to the state, which was once the national icon for honest, open, accountable and clean politics and good government in the nation. This battle has already been joined and will not cease until we once again prevail. Should Politicians' Text Messages Be Secret? The corrupt status quo in Wisconsin not only prevailed on Monday, it triumphed completely. The majority party in the State Assembly and the State Senate moved Wisconsin far back into the past, vanquishing more than 100 years of transparency and sensible limits on special interest political money – reforms which, in part, date back to the Governorship of Robert M. LaFollette, Sr. The destruction of the nine-year-old, non-partisan Government Accountability Board was based on completely discredited charges, false premises, character assassination and outright falsehoods. The enactment into law of both the GAB destruction (AB 388) and campaign finance deform (AB 387) measures, in combination with the recently enacted law to exempt political crimes from being investigated under the state’s John Doe process – all combine to allow political corruption to take root and flourish in Wisconsin. In secret. Legislative Democrats and Republican State Senator Rob Cowles of Green Bay deserve citizen thanks for opposing the campaign finance deform legislation. Legislative Democrats and Republican State Representatives Todd Novak of Dodgeville, Warren Petryk of Eleva and Travis Tranel of Cuba City deserve thanks for opposing the GAB destruction measure. This will be remembered as one of the saddest and darkest days in Wisconsin history, at the end of one of the most horrendous months in our state’s 167-year history, when honest, accountable and transparent state government was systematically dismantled in favor of hyper-partisan political advantage, retroactive decriminalization, and revenge. The sun will rise again in our state. But we will all need to pull together to make that happen. With Wisconsin's – and the World's – concern and attention now rightfully focused on the terrible events taking place in France and in Lebanon – and the accelerating possibility of wider conflict and increased human suffering – Wisconsin Assembly Speaker Robin Vos still seems determined to proceed with his hyper-partisan, misguided and completely self-serving agenda to rig Wisconsin elections for Republicans and enhance his own personal power. Today, in an "Extraordinary Session," Vos hopes to ram through the Assembly the destruction of the Wisconsin Government Accountability Board and the virtually complete deregulation of Wisconsin's campaign finance laws, flooding the state with secret, undisclosed money. If there was ever a more tone-deaf, selfish action undertaken by a state politician and political party in the last 50 years, we challenge you to tell us what it is. It is tantamount to Nero fiddling while Rome burned. Today is the last chance for Wisconsinites to weigh in with legislators against the GAB Destruction (Assembly Bill 388) and the Campaign Finance Deform (Assembly Bill 387) legislation that, together with creating an exemption for politicians only, from being subjected to investigation for political corruption under the state's "John Doe" law, has been the sole focus of the Republican-controlled State Assembly and State Senate for the last three months. Last weekend, in the middle of the night, the GOP State Senate pushed through it's slight modifications to Campaign Finance Deform and GAB Destruction. The State Senate vote on November 6-7th was in and of itself, quite literally one of Wisconsin's darkest moments ever. It set the stage for today's perceived urgent need to play out this Greek Tragedy to its final, horrific denouement. All of this was completely avoidable and it never should have happened. 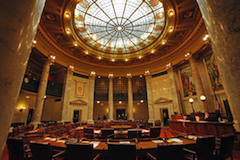 Sunday's Wisconsin State Journal editorial: "Bills will kill GAB, protect dark money" provides a damning closing argument against AB 387 and 388. It further calls on Governor Scott Walker to show unexpected wisdom and leadership by vetoing both measures should they pass the State Assembly (as expected) probably later tonight or perhaps early Tuesday morning (more bad legislating in the dark of night, out of the public's view). Read the WSJ editorial. We have said from the beginning that few, if any, real Wisconsinites support AB 387 or AB 388. The chief proponent of these measures seems to be Eric O'Keefe, the shadowy long-time head of Wisconsin Club for Growth, who has been the driving force behind exempting political corruption from the John Doe law, eviscerating and re-partisanizing the GAB, and, in legalizing what had long been illegal in Wisconsin – the coordination and collusion between candidates with outside, independent special interest groups who run "issue ads" before elections, which are really campaign ads masquerading as issue advocacy. O'Keefe is also the puppet master who paved the way for the conservative majority on the Wisconsin Supreme Court in July to "retroactively decriminalize" such illegal campaign coordination (and thereby "absolve" Scott Walker of any "sin" during the 2012 recall election), when his Wisconsin Club for Growth spent over $8.5 million (in outside spending) to assist in electing the four conservative justices who issued one of the most flawed, illogical and contorted legal opinions in the history of Wisconsin jurisprudence. State Representative Terese Berceau (D-Madison), Common Cause in Wisconsin and other reformers, on Friday, announced an alternative campaign finance plan to help lead Wisconsin out of the deep darkness now being created by Vos, State Senate Majority Leader Scott Fitzgerald (R-Juneau) and Eric O'Keefe. But that campaign will commence in earnest after the vote today to deform campaign finance law and to destroy the GAB. Today – now – you must contact your State Representative and demand that she or he vote against both AB 387 (campaign finance deform) and AB 388 (GAB destruction). If you don't know who your State Representatives are, go here. Never underestimate your ability as a citizen to effect change. Your voices helped convince three Republican State Representatives to vote against the GAB destruction measure in October, and you helped convince GOP State Senator Rob Cowles of Green Bay to vote against the campaign finance deform bill last weekend. So please weigh in now, and do so again if you have done so before. Above all, never give in. Never surrender. On Wisconsin! Help Us "Pack the Parlor" in the Capitol Friday Morning in Support of Genuine Campaign Finance Reform! We know this is incredibly short notice, but it's important. On Monday, November 16th, the Wisconsin Assembly will vote on the Campaign Finance Deform (Assembly Bill 387) and GAB Destruction (Assembly Bill 388) legislation. As you know, both measures passed in the State Senate in the dark of night last weekend. Tomorrow, Friday – at 10 AM in the Assembly Parlor (just off the Assembly Chamber in the State Capitol) – Common Cause in Wisconsin and other reformers will gather with State Representative Terese Berceau of Madison and former State Representative Penny Bernard Schaber of Appleton to briefly discuss what real campaign finance reform ought to look like, instead of what passage and enactment of Assembly Bill 387 will cause: the unleashing of a tsunami of secret, special interest money in our elections and public policy-making; the legalization of formerly illegal coordination of candidate campaigns with "outside" special interest groups; and the unlimited corporate and wealthy donor money that will flood the Capitol and promote political corruption. If you are in or near Madison on Friday morning, we need you to come to the Assembly Parlor and stand with us against political corruption and in support of disclosure, transparency, and sensible limits on special interest money in our politics and elections. It won't take much time, but legislators and the media need to know that real Wisconsinites are opposed to the sale of our state to out-of-state (and some in-state) wealthy donors and interest groups. So help us "Pack the Parlor" on Friday morning at 10:00 AM in your State Capitol Building. 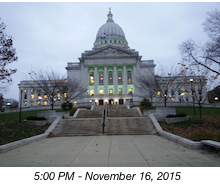 Read or re-read Jay Heck: Shrouding Wisconsin in secrecy in the dark of night; GOP prevails on GAB, campaign finance; and/or How Dark Money Will Rule Wisconsin if you require any further inspiration. Hope to see you Friday morning in the Assembly Parlor in the Capitol! The late evening of Friday, November 6th, and the early morning of Saturday, November 7th, 2015 are two days that will live in infamy in Wisconsin. Forever. On that day, the Wisconsin State Senate finally convened in "extraordinary session" after the sun went down, to consider and vote on two measures that, if enacted into law, will quite literally shroud the State Capitol's denizens even more from public view by expanding the ability of secret special interest money to influence the outcome of elections, shape public policy-making in the Capitol, and enhance the opportunities for political corruption to occur without detection. Scarcely a month ago, no one in Wisconsin – other than the legislative Republicans and their special interest allies and confidantes – had any idea what was contained in either of these far-reaching measures. Not the media, not any good government groups, not the Democrats, and least of all – not you – the public. No one knew about this other than a small, exclusive group of GOP legislators and lobbyists. In short order, Assembly Speaker Robin Vos (R-Rochester) and State Senate Majority Leader Scott Fitzgerald (R-Juneau) unveiled the legislation, quickly scheduled it for a single joint committee legislative public hearing in Madison, rammed it through the Assembly and State Senate Elections Committees and, after a brief pause caused by minor disagreement among some State Senate GOP Senators with some provisions in the measures – forced an agreement. And then, with everyone singing from the same hymn book, both measures were scheduled for debate and votes on a Friday evening, so that virtually no one would pay attention to the wholesale slaughter of transparency and the ability to ferret political corruption out of state government in Wisconsin. * Codifies into law the ability of candidates to be able to collude and coordinate with outside special interest groups in campaigns as long as the outside groups avoid using a few selected and limited words in their communications, such as "vote for" or "defeat" or "support." This is what is known as "express advocacy." Outside communications that use virtually any other words, however negative or laudatory, can be coordinated with candidates and, furthermore, require no reporting of disclosure of the donors. This is relatively unprecedented in the nation. Only Florida allows this. But the Wisconsin measure goes even further than Florida by allowing coordination between candidates and outside groups who engage in express advocacy as long as the "primary purpose" of the outside group is not to engage in express advocacy! What it all means is that a tsunami of secret money from within and outside of Wisconsin can flood our elections to influence our votes. No other state allows for as many opportunities for political money to escape simple, basic disclosure as this legislation will allow in Wisconsin. The purpose is simple: to keep Wisconsinites as ignorant as possible about who is influencing elections and controlling public policy-making in this state. * Allows political parties and legislative campaign committees (slush funds controlled by state legislative leaders) to collect unlimited corporate and other money for distribution to candidates and allows them to run undisclosed phony issue ads and to coordinate with phony issue ad groups. This will greatly empower the major political parties in the state but, much more alarmingly, will vastly increase the power of legislative leaders with unlimited political money to bestow upon, or withhold from candidates, at their whim, and to crush any dissent and threaten with primary opposition those legislators who defy the leaders and try to exercise independent judgment or dissent. This was at the heart of the 2001-2002 Legislative Caucus Scandal – political money in the Capitol compromising and undermining pubic policy-making. This provision will lead to far more secret money and opportunities to engage in illegal activity without detection. * Eliminates the currently required information about employers from individuals who make political contributions to candidates for state office. All that will be required to be reported will be the name, address and occupation of the donor. Which tells the public very little about her or him. Republican legislative proponents of AB 387/SB 292 have continually made the completely false and erroneous claim that they "had to" craft this legislation in order to bring Wisconsin into "compliance" with the Citizens United vs. F.E.C. U.S. Supreme Court decision of 2010 and because of other court decisions since that time. While some revisions to Wisconsin's decades-old campaign finance law are necessary, the revisions in this legislation most certainly are not required. Coordination can still be limited and disclosure can certainly be required. This measure was specifically designed to shroud Wisconsin in an impenetrable veil of secrecy and dark money, destroy transparency, and inject Wisconsin with an unlimited and inexhaustible supply of special interest money to ensure Republican control of state government for the near and distant future. That's hardly democracy. After Midnight, and into the early morning hours of Saturday, November 7th, the State Senate then considered and passed the Assembly Bill 388/Senate Bill 294 – the dismantling and destruction of the 8-year-old, nonpartisan Wisconsin Government Accountability Board. The vote – at 2:26 AM – was 18 to 14: all Republicans in favor; all Democrats opposed. Twelve Republican Senators who voted for this legislation, essentially flip-flopped in their support for the GAB since 2007 when they all vote to establish the non-partisan GAB. Nothing changed in the intervening 8 years except the politics. So these 12 State Senators were all for the GAB before they were against it. * Gets rid of the six non-partisan judges and replaces them with two six member commissions, one for elections and one for ethics, comprised of partisan political appointments – 3 Republicans and 3 Democrats – which all but guarantees tied votes and, therefore, gridlock and inaction. The State Senate added two retired judges to the ethics commission only, but it is unclear how they will be selected and whether they must be impartial or not. * Most significantly, it eliminates the independent, "sum sufficient" funding for investigations by the GAB into possible political corruption (being perpetrated by legislators, for example). This was the absolute most critical and central provision of the creation of the GAB in February, 2007. Without it, the GAB is under the complete control of the legislative leadership. This independent stream of funding for investigations acted as a huge preventative tool for corruption in the Capitol. Without it, the GAB will be feared by no one and ignored by most. That is by design. The GAB will be transformed into another WEDC – a toothless, ineffective state agency with no ability to effectively enforce election, campaign finance, ethics and lobbying law. And it will likely be utilized as a tool to aid in the achievement of the partisan political goals of the leaders of the Legislature and the Governor. The Assembly is tentatively scheduled to come back to Madison (at considerable cost to you, the taxpayer) on Monday, November 16th to vote on the Campaign Finance Deform and GAB Destruction legislation passed by the State Senate while you were sleeping this past weekend. This is no time to just shrug and say there is nothing you can do. There is plenty we can do. Contact your State Representative and tell her or him to oppose and vote against the GAB Destruction and Campaign Finance Deform legislation passed by the State Senate. If you are not sure who your State Representative is, go here. After fleeing the Capitol on Tuesday with his fellow Republican State Senators in tow, to hammer out differences in secret, State Senate Majority Leader Scott Fitzgerald (R-Juneau) apparently "has the votes" to go to the floor of the State Senate Friday in "Extraordinary Session" to pass the GAB Destruction (Senate Bill 294) and Campaign Finance Deform (Senate Bill 292) measures. The entire process under which Senate Bill 294 and Senate Bill 292 were first unveiled (less than a month ago), fast-tracked through a single public hearing in Madison only, and then rammed through committees and rushed to the floor of the Wisconsin Assembly and slammed through, before being stalled for a week in the State Senate, has been among the most abusive, disrespectful, secretive and despicable in the history of the Wisconsin Legislature. Certainly in recent memory. Calls and messages from thousands of Common Cause in Wisconsin members and other Wisconsinites to State Senators opposing SB 294 and SB 292 helped cause Fitzgerald to have to postpone Senate floor sessions twice and have to convene an extraordinary session Friday. The taxpayers of Wisconsin will have to bear the considerable cost of having the State Senate in an extra day after the Fall Floor Session ends (today), and will then have to underwrite bringing back to Madison the State Assembly, tentatively, on November 16th, to ratify the cosmetic changes that the Republicans in the State Senate make to the GAB Destruction and Campaign Finance Deform measures, that passed in the Assembly on October 21st. And for what? To pass Senate Bill 294, a measure that will eliminate the Government Accountability Board, the state agency established by a virtually unanimous bipartisan vote by the Legislature in January, 2007, to enforce Wisconsin's election, campaign finance, ethics and lobbying law and to investigate corruption in state government. The power to investigate will be vanquished as will the six non-partisan, retired judges that apply the law rather than adhere to partisan interests. Instead, two six-member commissions of partisan hacks (with possibly a couple of judges on one of the commissions) will make decisions and will have to go hat in hand to partisan legislators for funding to mount any type of effective investigation of political corruption. The GAB will become a toothless, ineffective backwater state agency that will command the respect of no one in Wisconsin. Think WEDC! And, Senate Bill 292, the completely hyper-partisan GOP re-write of Wisconsin's campaign finance law that will make Wisconsin one of the worst states in the country in terms of disclosure and transparency of political money that will flood the state to influence the outcome of our elections by out-of-state special interest groups and billionaires. It will also codify into law the ability of candidates to coordinate with outside special interest phony issue ad groups, effectively rendering campaign contribution limits meaningless. No other state in the nation has gone as far as SB 292 in enshrining into law this kind of coordination which will shroud in secrecy the overwhelming majority of political money in our elections. It will also allow legislative leaders to collect unlimited money for their legislative campaign committees, which they can use to exercise dictatorial power over rank-and-file legislators and crush dissent or any independent thought. It will also enhance the opportunities for undetected political corruption to flourish in the Capitol. Think Legislative Caucus Scandal of 2002 on steroids! CC/WI has opposed both of these measures in the Assembly and now in the State Senate – even with the reported changes, which we have not yet seen in legislation yet. But they sound to us to be far too little, however late. Very, very few real Wisconsin citizens support either of these measures. That's why GOP legislative leaders had to depend on out-of-state money from "Americans for Prosperity" and from Wisconsin Club for Growth to run ads and make "robo" phone calls into the districts of four "wavering" Republican Senators. Thousands of Wisconsinites have communicated their opposition to both SB 294 and SB 292. And we must continue to do more in the next two days. We could still change some minds and defeat one or both measures, even though Fitzgerald thinks he "has the votes." Let's prove him wrong! It is critical that you take action today – and call on your friends and neighbors and family to do so as well – to stop this frontal assault on democracy. Remember, these measures already passed in the State Assembly two weeks ago, so – if they are to be stopped – it is up to us to do so in the State Senate now! The votes on both SB 294 and SB 292 are scheduled for Friday, November 6th. And, while the Koch Brothers and Wisconsin Club for Growth have been running ads and making calls into the districts of the hesitant GOP Senators to convince them to vote for SB 294 and SB 292, we have YOU to counter their out-of-state money and power. Contact your own State Senator – and then contact at least one and, preferably all of the six reluctant GOP State Senators below. If you are one of their constituents, be sure to let them know! Urge them to vote against both SB 294 and SB 292. We need only three, and possibly only two of them to defeat these horrendous measures. To read CC/WI's written testimony in opposition to the GAB Destruction measure, go here. To read our written testimony opposing the campaign finance deform measure, go here. To read the numerous articles, interviews and press releases on both measures, see the "CC/WI in the News" section in the sidebar to the right. Don't delay. Act today. Never give in. On Wisconsin! 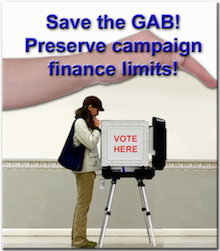 GAB Destruction & Campaign Finance Deform Bills Could Get Votes in State Senate Tuesday! As of early this Monday morning, State Senate Majority Leader Scott Fitzgerald (R-Juneau) hasn't informed Wisconsin citizens of his plans yet, but he could schedule a vote on the GAB Destruction (Senate Bill 294) and Campaign Finance Deform (Senate Bill 292) measures today, for a vote tomorrow. That means we may have our last opportunity to weigh in against these awful, self-serving measures that undermine democracy and attempt to consolidate one-party control over Wisconsin for years to come. A number of Republican State Senators have expressed concerns about the GAB destruction legislation, the campaign finance deform measure or both and Fitzgerald has been arm twisting them while powerful, out-of-state special interest groups like the Koch Brothers-funded Americans for Prosperity and Club for Growth have been running ads and making phone calls into the districts of the hesitant GOP Senators – trying to gin up support that is certainly not coming from any Wisconsin citizens in their districts or elsewhere in the state. Not a single Wisconsin daily (or weekly) newspaper has endorsed SB 294 or SB 292 and more are weighing in heavily against them with each passing day. Just this weekend the Wisconsin State Journal and the Green Bay Press-Gazette denounced the GAB destruction measure (SB 294) and in the Sunday Milwaukee Journal Sentinel, national campaign finance law experts from the Brennan Center of Justice and the NYU School of Law said that the campaign finance deform measure (SB 292) would make Wisconsin one of the worst states in the nation in terms of electioneering disclosure and transparency. For a longer, audio explanation of these measures and why they are so detrimental to Wisconsin, you can listen to an interview with Jay Heck here. It is critical that you take action today – and call on your friends and neighbors and family to do so as well – to stop this frontal assault on democracy. Remember, these measures already passed in the State Assembly two weeks ago so, if they are to be stopped – it is up to us to do so in the State Senate now! As we have said, six Republican State Senators have expressed some reservations about the GAB destruction (Senate Bill 294) and/or the campaign finance "deform" (Senate Bill 292). We only need to turn three GOP votes against these measures to stop them. And, as we have also said, Republican leaders in the State Senate have been meeting in secret to try to strong arm the six GOP holdouts into voting for this horrendous legislation. And again, the votes could occur as soon as tomorrow – Tuesday, November 3rd. And, while the Koch Brothers and Wisconsin Club for Growth are running ads and making calls into the districts of the six hesitant GOP Senators to convince them to vote for SB 294 and SB 292, we have YOU to counter their out-of-state money and power. Don't delay. Act today. Let's stop this. For us. For our kids. For Wisconsin! VIDEO: Jay Heck, Common Cause of WI, Assembly Parlor Fri, criticizes GOP campaign finance bill-AB 387 which will be voted on Monday. Wisconsin Republicans: "The More Money in Politics, the Better"
Editorial: What has Gov. Scott Walker got to hide? Plain Talk: Politicians working for the citizens? Ha! The hyper-partisan, and – until recently – secret, Republican massive rewrite of Wisconsin's campaign finance laws would transform "Wisconsin's political system from one of the most open and transparent in the nation to one of the least. They are not required by any federal or state court case; in fact SB 292/AB 387 would leave Wisconsin with far weaker transparency protections that those upheld by the U.S. Supreme Court in Citizens United v. FEC." This, according to among the foremost legal experts on campaign finance law in the nation, the Brennan Center for Justice at New York University School of Law. Here is their analysis of Senate Bill 292, still pending in the State Senate, and Assembly Bill 387, which passed last week in the State Assembly. Wisconsin and Wisconsinites do not want to go into this literally dark and secret place! After being rammed through the Wisconsin Assembly last week, the assault on democracy could continue this week when the State Senate may take up the Government Accountability Destruction Act (Senate Bill 294) and the Campaign Finance Deform & Decrease Disclosure Act (Senate Bill 292). Rumors swirled around the Capitol Monday that the GAB legislation might be suddenly put on the calendar for today, Tuesday, but apparently State Senate Majority Leader Scott Fitzgerald hasn't strong-armed enough reluctant GOP Senators to cinch the requisite number of votes. Those Republicans who have dared to express unhappiness about the GAB evisceration legislation may include Rob Cowles of Green Bay, Luther Olsen of Ripon, Sheila Harsdorf of River Falls, Howard Marklein of Spring Green, and possibly Jerry Petrowski of Marathon and even Terry Moulton of Chippewa Falls. Fitzgerald understands that the longer Senate Bill 294 is exposed to sunlight and scrutiny, the more Wisconsinites scorn it and see it for the self-serving, hyper-partisan, hypocritical proposal that it really is. Three Republicans in the Assembly bucked Speaker Robin Vos and voted against the measure last week. There ought to be at least that many GOP State Senators who can resist pressure from their leadership and special interest groups to vote with their constituents and against this abomination. Likewise, the secret, massive, hyper-partisan GOP rewrite and deform of Wisconsin's entire campaign finance law, (Senate Bill 292), is not moving through the State Senate either at the moment. Again, maybe enough Republican State Senators have come to their senses and realize that: legalizing coordination between candidates and outside issue ad groups (which is legal no where else in the nation), allowing unlimited money to flow to the legislative campaign committees (controlled by Fitzgerald on the GOP side), and all but eliminating meaningful disclosure and transparency of both, contributions to candidates and outside special interest money, are all horrible ideas that the vast majority of Wisconsin citizens abhor. And they should, too. This is the time to contact, not only your own State Senator (and please do that), but also to contact Cowles, Olsen, Harsdorf, Marklein, Petrowski and Moulton and urge them to vote against both the GAB Destruction Measure (Senate Bill 294) and the Campaign Finance Deform Measure (Senate Bill 292). To get contact information for your own State Senator and for the six GOP Senators who need to hear from you as well, go here. Please make these contacts in the several days as either or both measures could be scheduled for a vote at any time. For more information about recent developments in these and other critical democracy issues that CC/WI is involved in, please view these articles and stories from: Wisconsin Public Radio, Wisconsin Radio Network, Shepherd Express, Think Progress, Janesville Gazette, and The Joy Cardin Show (on WPR). In other news, our friends at the League of Women Voters of Wisconsin are holding a free public forum tomorrow night on the importance of ending partisan gerrymandering and enacting redistricting reform legislation in Wisconsin before the next redistricting process occurs in 2021. 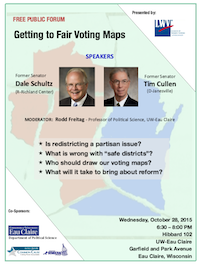 The forum, entitled "Getting to Fair Voting Maps" will take place Wednesday, October 28th from 6:30 to 8:00 PM at UW-Eau Claire. Former State Senators Tim Cullen (who is now a CC/WI Board Member) and Dale Schultz will be the main speakers of the event, which CC/WI is proud to sponsor. If you are in or near the greater Eau Claire area, we urge you to attend!